We source our raw materials from more than 130 countries worldwide: high-quality teas, tea specialties, herbs, fruits and spices. Many longstanding, trustful partnerships feed into this, including with the world's best tea gardens, giving our experienced buyers reliable access to the premium qualities, which we in turn can continually offer to our customers. One element in our purchasing policy is contract cultivation, where selected plantations produce exclusively for us and keep us supplied with excellent teas. Along with the large variety of teas, our experts also source a wide selection of high-quality fruits, herbs and spices, which they obtain from a broad range of growing areas around the world, e.g. for the production of individual tea blends. By teaming up with producers for joint cultivation projects, we can influence the product quality from the young plants through to harvest, and help our partners make the switch to ecological, sustainable cultivation. By committing to purchase their harvests, we ensure the marketing of their products and thus contribute to the commercial success of their company. To be recognised as a tea taster, you have to invest many years in training and taste hundreds of thousands of cups of tea. This not only means a lot of tea, but also a great deal of dedication. Our expert tea tasters test and evaluate a never-ending stream of samples from all over the world for quality, and buy the raw materials in the tea-growing areas, at ‘origin’. 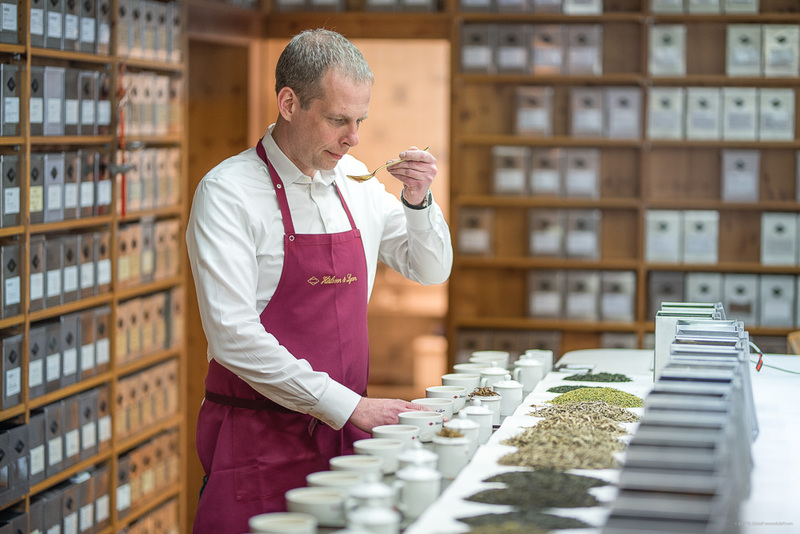 Each tea is sampled repeatedly and subjected to extensive testing – immediately after harvest, during shipment, and once again when it reaches the warehouse in Hamburg.